Labor and Liberal Coalition. In the hypocrisy stakes, it’s hard to tell them apart. Opposition leader Tony Abbott flips flops about, lately denying that the Liberals have any plans to develop nuclear power in Australia. But they’ve always had that aim – and just see now, that it is not electorally popular. They probably will lose this election – so let’s not waste too much space on them. 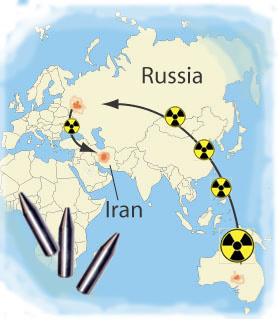 The Labor government won power from John Howard’s Liberals in 2007, largely on promises to act Climate Change, to remove the Commonwealth Radioactive Waste Management Act, to oppose nuclear power, and to refuse to send uranium to Russia. Labor has reneged on all of these promises. But the most hypocritical of all has been Labor’s determination to impose a radioactive waste dump on Aboriginal land. 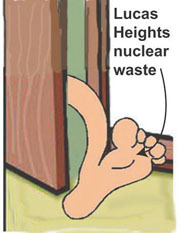 The new National Radioactive Waste Management Act 2010 is more draconian than the Howard one. It overrides State and Territory laws. It deems ineffective any Commonwealth, State or Territory law to the extent that any law hinders or prevents the Commonwealth from doing anything necessary regarding the site…This includes overriding State and Territory laws relating to environmental land use, archaeological sites, aboriginal heritage and the control and transport of radioactive material or dangerous goods……. By having to deal with the money quarantining, Aboriginals had to move into towns. The government now extended the welfare quarantining to non Aboriginals (for whom the traditional land ownership is not an issue). While former Labor minister Gareth Evans struts the world stage to make Australia appear a leader in Nuclear Weapons Non-Proliferation, the Australian government does all it can to promote the sale of uranium. Piously, Labor pretty much ignores what is done with Australian uranium. Uranium is to be sold to Russia. Hypocritically, Labor makes a stand on not selling uranium to India – that probably has most to do with the desire to sell it to India’s powerful rival – China. Labor has quietly kept Australia signed up to the International Framework for Nuclear Energy Cooperation, which will require Australia to lease uranium overseas, and to take back the radioactive wastes. A good servant to the nuclear corporations, Julia Gillard has exempted uranium mining from the Resources Rent Tax. 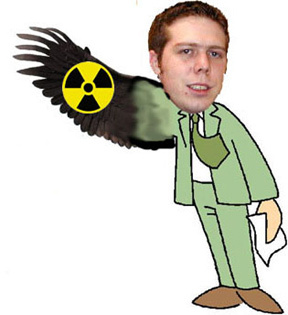 Labor’s go go guys – Martin Ferguson, and Paul Howes, are hand in glove with the big uranium corporations. At the State level, South Australia allows BHP Billiton’s OLympic Dam uranium mine exemptions from Aboriginal Heritage Act, Environment Protection Act, Natural Resources Act, & Freedom of Information Act. BHP pays nothing for its daily 35 million litres of groundwater. Australia is contractually obliged to take back the relatively small amount of nuclear wastes that originated at the Lucas Heights nuclear reactor, in Sydney. Scientific assessment was that Woomera in South Australia is the most suitable location for this. But both Federal and South Australian governments decide that Aboriginal land in the Northern Territory is best. Easier to trample on Aboriginal rights, and easier to coerce a Territory government, rather than a State one. Also – the Muckaty, Northern territory location could turn out to be very handy – should President Obama and Prime Minister Julia Gillard do a deal.